Lancashire captain Dane Vilas hailed his side’s collective performance after their winning start to the Specsavers County Championship Division Two season. The Red Rose began their bid to return to the top flight with a seven-wicket victory against Middlesex at Lord’s. It was a match that featured centuries from Haseeb Hameed and Rob Jones, as well as a five-wicket haul for Tom Bailey and Glenn Maxwell. Vilas said: “I think this was the perfect start to the season for us. I thought it was a great all-round performance. “We want to have a team focus this year. There were a lot of individual performances last year and we are trying to get the team on the right track with everybody contributing at the right time. “We had two hundreds, two five-fors and some great fielding here, so a perfect team performance. “I think it was the most complete performance we’ve seen for a while. “We’ve had a few really good performances in past seasons, but this one really stands out, especially at a place like this and at a time when there is the disappointment of last season and the importance of starting well. So, this is probably the best performance. 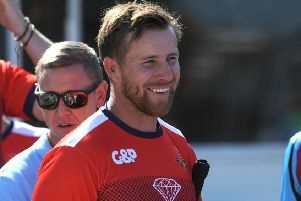 “Middlesex are a really good side with previous Test match players and guys who are trying to push for England honours. Malan was one of two half-centurions for Middlesex in their second innings, hitting 51 before falling to Maxwell. “I wouldn’t say there was a lack of fight,” he said of his side’s performance. “It was just the whole way we played the last four days has been pretty poor. “We have obviously got guys who are coming back and who haven’t played a lot of cricket over the last year-and-a-half and batsmen who haven’t performed as well as they have over the last year or so. “But it is too early in the season for pointing fingers, shouting and screaming. Lancashire are back in action tomorrow when they host Worcestershire Rapids in their opening Royal London One-Day Cup match at Emirates Old Trafford (11am).